Carrying a big old photo album and a familiar-looking blue-covered notebook, the old man led the way up a narrow staircase. Upstairs a table and a few chairs were in the middle of a big light-filled room. He pointed me to a chair, settled himself into the other one, and looked me fair in the eyes. Always a difficult question, that. And particularly so when the old man asking it is a Bomber Command veteran with 37 operations to his credit. But this was the situation that I found myself in one Wednesday afternoon recently, when I went out to Melbourne’s eastern suburbs to talk to one Gerald McPherson. Cyril, Harry and Gerald McPherson. One of his other brothers was in a reserved occupation and thus unable to enlist. He was a telegraphist at the Horsham Post Office. “If anything had happened to us”, Gerald said soberly, “he would have been the first to know.” But while Gerald was awaiting call-up, his brother taught him Morse code at the Post Office. And so when this became known at Initial Training School, he found himself earmarked for training as a wireless operator. 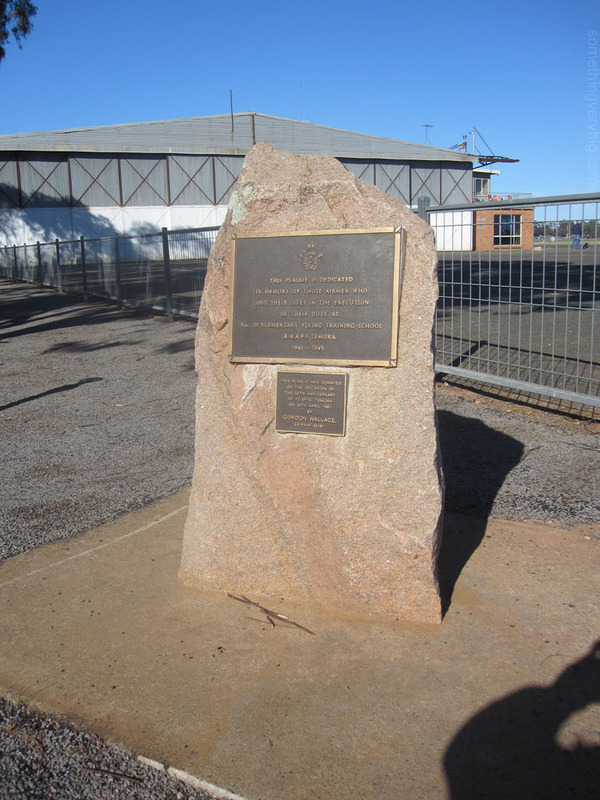 At that stage in the war, a Wireless Air Gunners School was operating at Ballarat, north-west of Melbourne. Gerald was there between April and August 1943 – straight through winter. And Ballarat is, he reckons, one of the coldest places in the country. “We wore our complete flying kit to bed at night!” he told me. Matters were not helped by the gap of several inches between the bottom of the doors and the floor of the Nissen hut in which they were accommodated. Gerald made an important discovery at Ballarat. While he could send and receive messages – a legacy of the lessons with his brother – he realised that he had no aptitude at all for taking a wireless set apart, finding and repairing any faults and putting it together again. 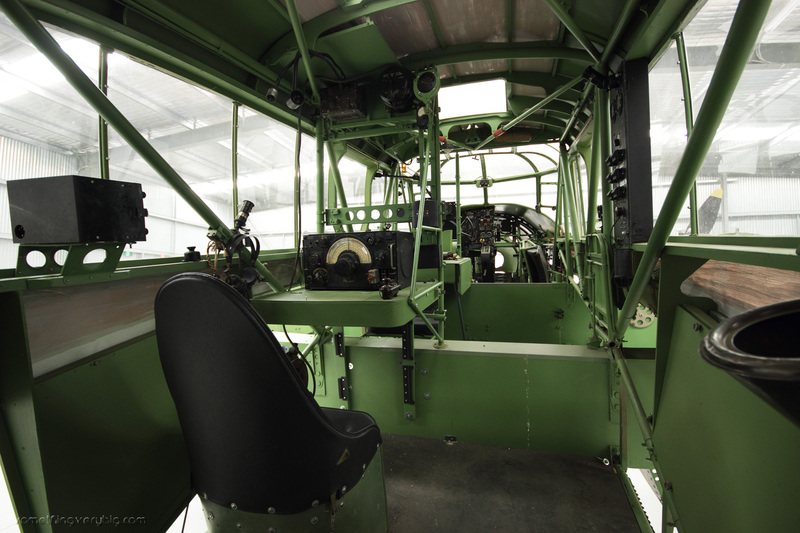 As this was a vital part of the wireless operator’s role in a heavy bomber crew, he asked to be transferred to become a straight air gunner only. Logbooks are good things to pore through. The entries are usually brief, to the point and largely emotionless. But they offer a convenient stepping-off point for further discussion, particularly when their owner is sitting across the table from you. The first page of Gerald’s revealed, over a week and a half in August-September 1943, a little over nine hours of flying, all by day, at No. 3 Bombing and Gunnery School, West Sale. “You trained in Fairey Battles, I see?” I asked. “Terrible aeroplanes. Cramped… and the glycol fumes!” he said, rolling his eyes. “And I almost fell out of one once.” Apparently he dropped a full magazine of bullets over the side, leant over and caught it – “good thing I was playing so much cricket then” – and only then realised that his safety belt was not secured to the aircraft. Shaking my head in amazement, I turned to the next the page of the logbook. Here the entries begin on 3 March 1944, and the flying is in Wellingtons from 17 Operational Training Unit at Turweston, in the UK. Wait a second. Now he’s in the UK? But what about the rest of his training? Surely he can’t have had just nine hours of dedicated gunnery training in the air before he qualified as an air gunner? I looked for the page that I felt sure I had missed. But there was none. 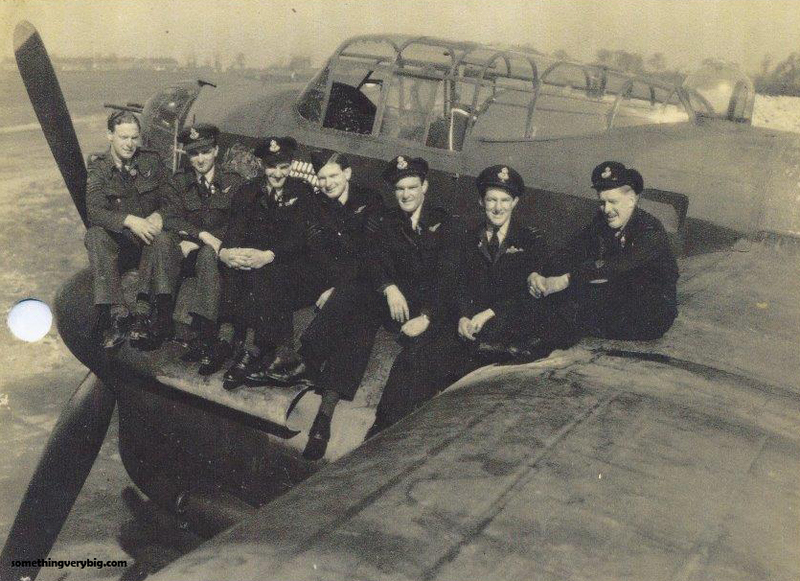 Air gunners in Bomber Command really were sent overseas and joined a crew with fewer than ten hours flying time. 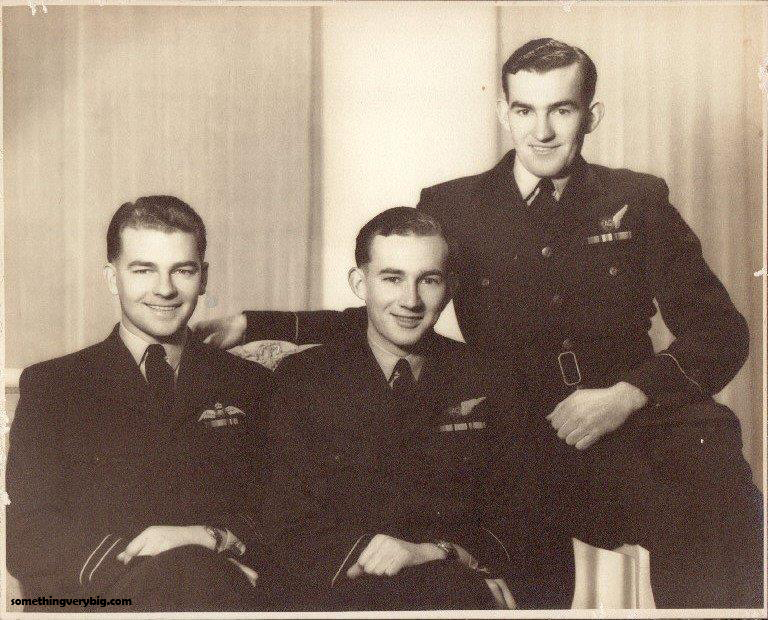 Dale Johnston, the wireless operator on B for Baker had been in the service for a year and nine months and navigator Jack Purcell for more than two years when they first arrived at 9 Squadron at the end of October 1943. In contrast, Gilbert Pate, their rear gunner, took about a year and a quarter from enlistment to arriving at his first operational squadron, and he spent a month and a half in transit to the UK. Eric Hill, B for Baker’s English mid-upper gunner who, of course, did not have to travel half way around the world, was in the Royal Air Force for just six and a half months before he arrived at his first operational squadron. I knew that it didn’t take long to train a gunner to the point where they qualified to wear the half-wing with ‘AG’ on it. 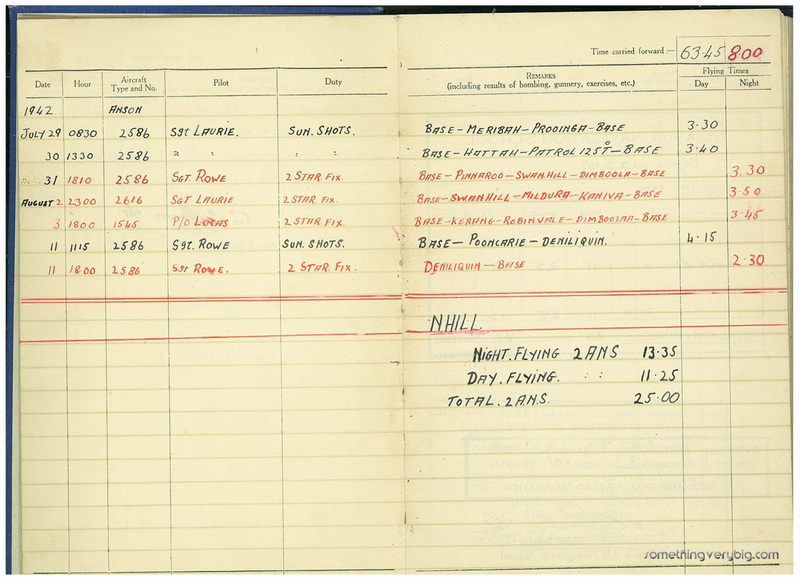 But seeing Gerald’s logbook brought home with a thud just how little flying experience was involved before a gunner crewed up at an OTU. 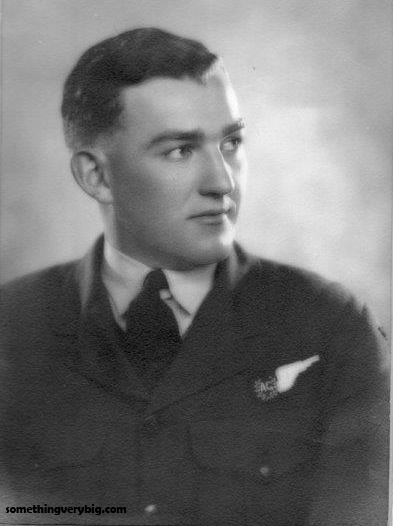 Gerald had been in the Air Force for nearly 18 months by the time he reached an operational squadron, but getting to the UK took four and a half months of that. He was packed off to war having completed a three month course at an Initial Training School and three weeks at Air Gunnery School, with a total of nine hours and ten minutes in his logbook. Gerald crewed up at OTU in the usual fashion: equal numbers of each trade were sent into a big room and told to sort themselves out. Shortly afterwards they needed to replace their wireless operator, who had filled in for another crew on a training flight but was killed when the Wellington in which he was flying ditched into the North Sea after an engine failure. 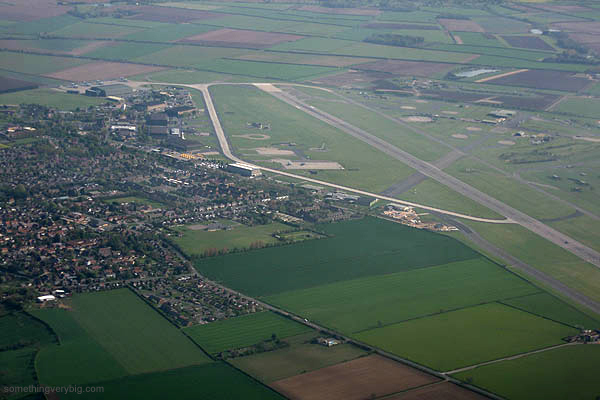 And soon after they got to 15 Squadron at Mildenhall, their pilot – Kiwi Flight Sergeant Jim Houghton – went on the usual second dickie trip to gain some experience before taking his own crew on ops. But as happened far too often, the aircraft he was on failed to return and Houghton was killed. Gerald told me that the Squadron Commanding Officer called them into his office and offered for them to remain on the squadron as ‘spare bods’, filling in for aircrew temporarily unable to fly with their own crews. Knowing from the loss of first their wireless operator and then their skipper that flying with strange crews was frequently a virtual death sentence, however, the crew managed to convince the CO to send them back to a Heavy Conversion Unit so they could find another pilot. Finally Gerald and his crew – now led by Australian Flight Lieutenant Jeff Clarson – arrived at 186 Squadron, newly reformed at Tuddenham in Norfolk and under the command of Wing Commander JH Giles, a Canadian. Gerald maintains a very high degree of respect for his ‘Wingco’, telling me that instead of sending newly arrived pilots on second dickie trips, Giles would take the entire crew on their first trip himself. This being a very unofficial practice, Giles apparently did not even put the flights into his own logbook. So it came to pass, as it were, that on 28 October 1944, Gerald and his crew climbed into a Lancaster with Wing Commander Giles for a daylight raid on Flushing. But they needed to swap at the last minute into a spare aircraft, and as they clambered aboard and did their pre-flight checks, Gerald discovered that the rear turret had no guns fitted. He told Giles over the intercom – but they were already late and there was no time to fix it. “Just keep a good look-out”, Gerald was told, “and sing out if you see anything”. He now reckons he’s the only gunner in Bomber Command to have gone on his first trip without guns! Incidentally, this kicked off an interesting discussion about just how useful four Brownings weren’t against cannon-armed German fighters. Gerald confirmed my impression that most of the time it was considered better to evade nightfighters than to engage them in an uneven firefight. Indeed, just over a week after the attack on Flushing, Gerald and his crew flew on their first night raid to Coblenz in Germany. “Attacked by JU-88”, I read from his logbook. What actually happened was that the mid-upper gunner spotted the fighter close above them and reported it to the pilot. They altered course to see if it would follow them. It didn’t, probably indicating that the German pilot did not spot the bomber at all, and the Lancaster slipped away. Had either of the gunners opened up, the flashes from their muzzles would have drawn the attention of not just the JU-88 pilot, but of any enemy fighter nearby, putting them into a very dangerous situation. “You can’t fight cannon with machine guns”, Gerald said. The crew, from left to right: P/O. Jock Hepburn D.F.M. Flight Engineer, P/O. Dennis Parrish Bomb Aimer, P/O. Gerald McPherson Rear Gunner. P/O. Ron Liversidge Navigator, P/O. Jim Mallinson Mid Upper Gunner, Flt./Lt. Jeff Clarson D.F.C. Pilot, W/O. Wilbert Perry Wireless Operator. Their tour continued, not exactly uneventfully. They were shot at by a nightfighter on the way home from Leuna on 6 December 1944. The ‘cookie’ hung up over Gelsenkirchen three months later and had to be cut out with an axe. They thought they’d lost another wireless operator when ‘Grandad’ Perry (at all of 23 years, the eldest in the crew) went to fill in for a sick wireless operator with another crew to Dortmund. The aircraft crashed and blew up at the end of the runway and the rest of Gerald’s crew had been told that all on board had been killed and had already begun drinking to the memory of their late friend in the mess when the man himself appeared at the door. Apparently the other crew’s own wireless operator had been cleared to fly and turned up at the last minute and took over (full story here). 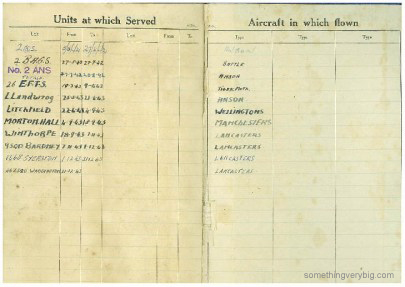 But as their tally approached the magic 30 that would usually mean the end of their tour, Bomber Command decided to raise the requirement to 35 because more crews were being lost than could be replaced. Gerald’s crew struggled to 33… and then it went up again, to 40. And so on 9 April 1945 they went on a night trip to Kiel, Gerald’s 37th all up. Over the target they were coned by a big pack of searchlights. For ten or fifteen minutes, pilot Jeff Clarson struggled to escape the blinding light. Flak damaged an aileron and it was a massive effort to recover, losing 16,000 feet in the process. At one point, flight engineer Jock Hepburn later told Gerald, they were actually upside down, not that Gerald could perceive that in his turret. They managed to return safely – though not before almost hitting another Lancaster near the Danish coast – and it was only after landing that they discovered that in fact they had no obligation to go on the operation in the first place. The previous day – before they took off for Kiel – the requirement for a tour had been dropped back to 30. Apparently this was brought to the attention of the new Commanding Officer, an Englishman, but he decided to leave them on the Battle Order. So Gerald finally finished his tour having completed 37 operations. Unusually among the veterans I’ve met, this included no fewer than 31 daylight trips. He was sent back to Australia and quite quickly demobbed, eventually to return to his pre-war job in the Personnel Department of ANZ Bank. He lived quite near Essendon Airport (in fact on my way to visit Gerald I had ridden the scooter past the site of his old house – it now hosts a block of serviced apartments) and played first-grade cricket for Essendon for many years. And it was after a cricket training session about a decade after the war when Gerald was in the bar at the Essendon Club with his team-mates and someone tapped him on the shoulder. It was Jeff Clarson, now a pilot with Ansett-ANA, in Melbourne on a night-stop. That turned into a much later night than had been planned, Gerald told me. When I next looked at my watch, Gerald and I had been sitting at that upstairs table for three and a half hours. The time had flown by and we had covered a lot of ground. Gerald’s wife, Fay – who had organised the visit for me – had stuck her head up once or twice to offer tea refills but otherwise just let us talk. By the time I arrived home she had already emailed me a copy of Gerald’s logbook (she also provided the photos in this post). I’m not, of course, the first person to interview Gerald (though this was more a chat than an interview). He also features in Michael Veitch’s excellent book, Flak. Between that and my afternoon with Gerald, I had indeed discovered everything I wanted to know. 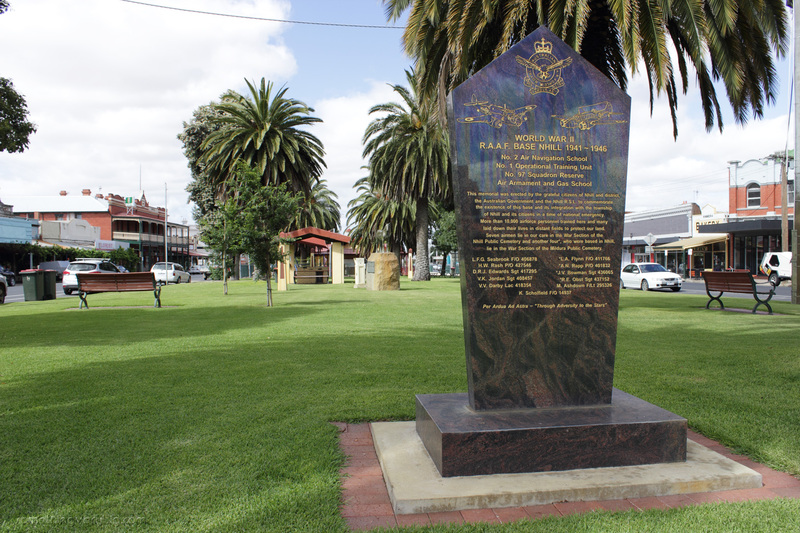 About 330km west of Sydney, in country New South Wales, lies a small town called Temora. It’s perhaps most famous these days for the superb aviation museum which has taken up considerable real estate at the local airport since its formation in 1999. Home to a significant collection of airworthy warbirds, most owned by Museum President and Founder David Lowy, the Museum is by far the best in Australia in terms of its airworthy fleet, and is perhaps the closest that we come to something like the Shuttleworth Collection at Old Warden in the UK. It puts on flying days every six weeks or so to display the aeroplanes in the element in which they belong – the air. It was to one of these flying weekends that I went in September 2009, in the back seat of a Piper Cherokee flown by a friend of mine. It was a great flight over in beautiful conditions, and I distinctly remember the chaos as we arrived in the circuit at Temora before the flying display started, just one of many light aeroplanes doing the same thing. There was so much traffic that we had to go around twice before we managed to land and at one stage we were on final for the runway and there were no fewer than four other aircraft in front of us. But once on the ground, the flying display was exciting and punctual and the organisation was superb. 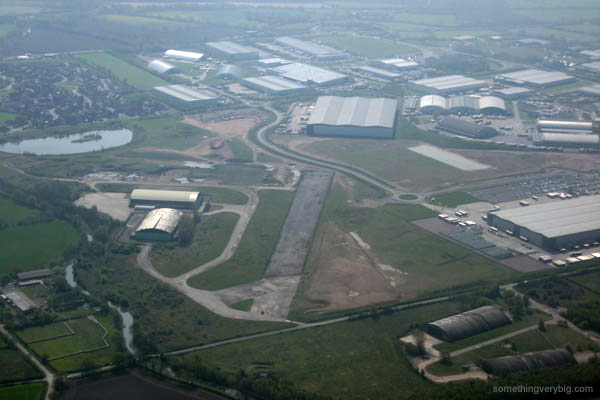 But as I was wandering around the airfield I noticed a familiar sight. 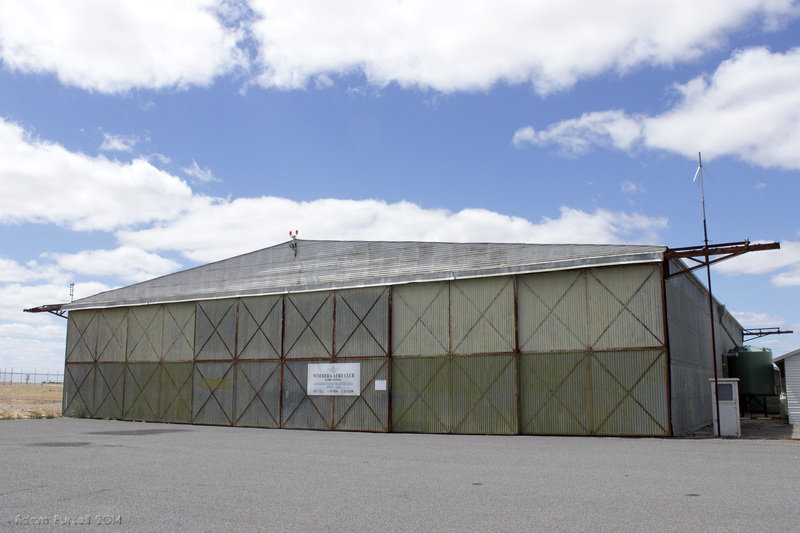 The hangar that now hosts the Temora Aero Club looked remarkably similar to many of the old hangars at Camden, which was the airfield from which I was doing my own flying at the time. 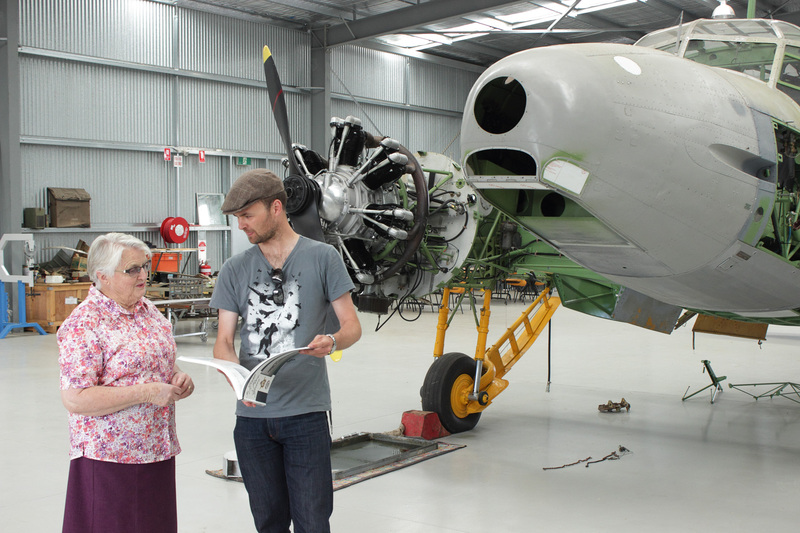 Could Temora have a similar wartime heritage? A sign near the entrance to the airfield records that upwards of 10,000 personnel passed through 10 EFTS during the war years, and that at its peak it had some 97 Tiger Moths on strength for pilot training. 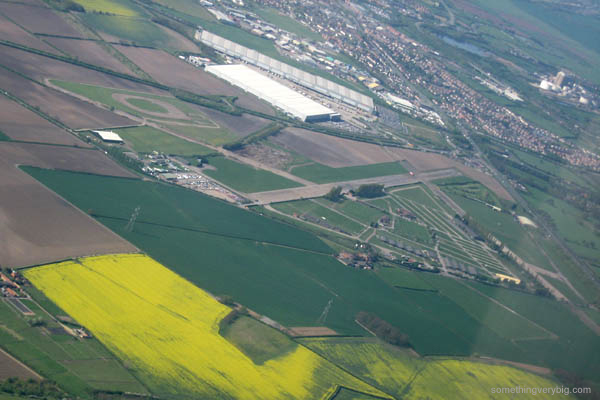 Four satellite fields scattered around the countryside were used when the congestion at the main airfield became too much. 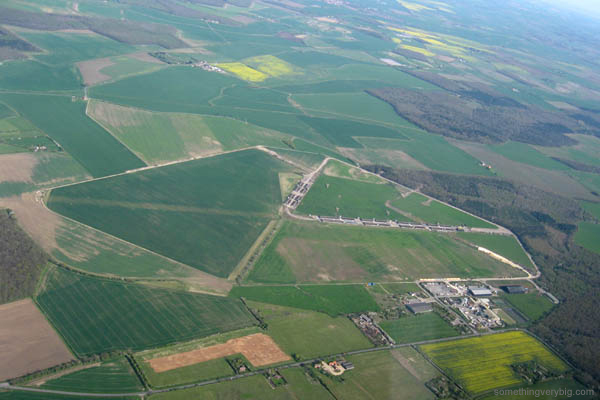 Tom Moore, who would eventually fly with 458 Squadron, said that the satellite fields were just that – fields – requisitioned off farmers with no buildings or facilities other than a bench from which the instructors could watch their students flying around. 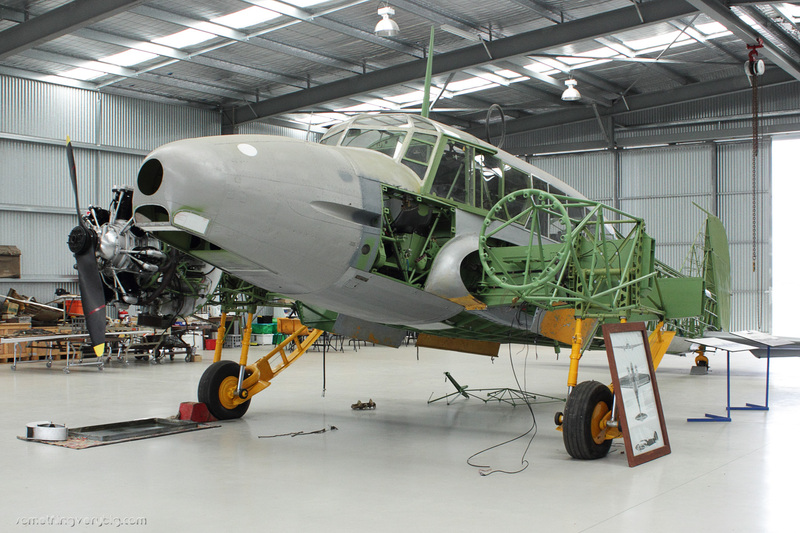 Like any EFTS, however, there were accidents during training at Temora. Sometimes they were almost comical – like one chap who “landed 20 feet off the ground and the plane just come down like that and the wings folded down around him,” as remembered by a 61 Squadron pilot named John Boland – but sadly, sometimes they were fatal. There are 13 of the simple white headstones denoting Commonwealth War Graves in Temora General Cemetery. 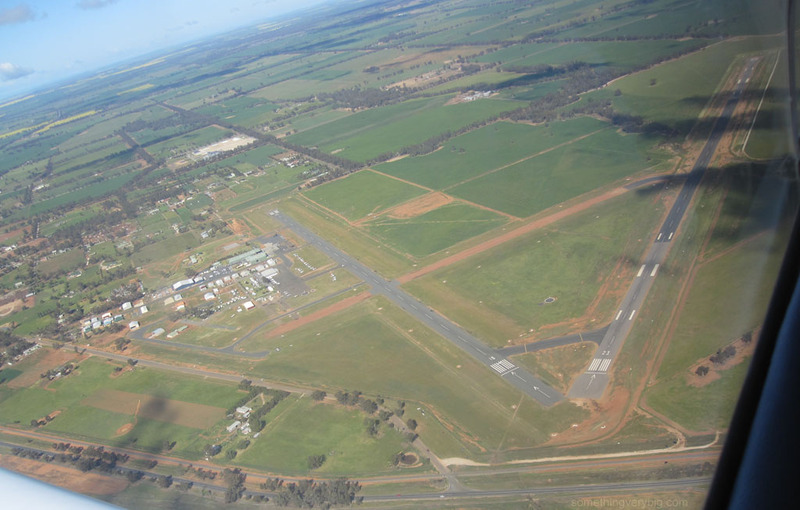 It’s not too far from the airfield into Temora itself, and after the flying display finished that September afternoon in 2009 my mate and I meandered in (without a white flash in our caps) to find a pub for dinner. 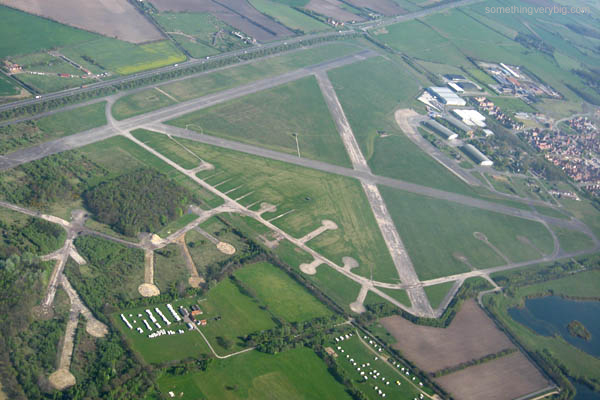 We stumbled the two miles or so back to the airfield a few hours later, much as I imagined countless trainee aircrew had done, almost seventy years before. As it turns out, today is also the tenth anniversary of my own first solo. It was in a Cessna 152, registered VH-WFI, from runway 16 at Wollongong, south of Sydney. After an hour or so of flying circuits, my instructor got out and I proceeded to fly one by myself. It was a slightly wobbly but passable exercise and I logged a princely 0.1 hours solo time in the process. Some years later, by this time a fully qualified private pilot, I would also experience solo flight in a Tiger Moth, in my own small way experiencing something of what these young men had been doing seven decades ago. And while that flight remains one of the most memorable ones in my logbook, I still remember the tremendous sense of achievement that followed my first solo. In 1940, said Don Charlwood, some 60,000 young men applied for the first 4,000 training places in the Royal Australian Air Force (C06-063-001). At that early stage of the war, competition for places was intense and the selection panels could afford to be a little choosy in the potential airmen they accepted. The process was quite involved. In March 1940, Phil Smith was one of the 60,000. He wrote a detailed account of his first experiences in a letter to his father later that day (A01-118-001). The interview panel consisted of three officers who asked general questions about aeroplanes, about Phil’s motives for joining up, and some technical questions about centrifugal force and specific gravity (“the first I explained only fairly and the second exactly,” he told his father). And that, he wrote, was about the limit of it. Then it was time for the medical exam. There was, he said, a long form to fill in. Then a general physical examination, including a colour blindness check, height and weight (while stripped), measurements of “buttocks to toes” and a check of the pulse. The eye exam appears to have been quite complicated, though in his matter-of-fact way Phil declined to describe the details as “I do not know what each was for”. The next three doctors came equipped with a battery of weird and wonderful tests. Ears were checked first with tuning forks and then with the aid of a little light. The same light was then used on the nose and throat. Phil was spun around ten times on a swivel chair and told to stand up straight afterwards. A dentist carefully checked his teeth. Blood pressure was measured. And then it was time for ‘the torture machine’. With a clip on his nose, Phil had to take a deep breath and then support an inch-high column of mercury for as long as possible. “I kept it up for over two minutes”, he wrote to his father, “but my ears are still singing”. Finally his reflexes were tested by scraping his instep with a sharp piece of iron. Recruit Dennis Over, who would eventually become a 227 Sqn rear gunner, concurred with the general contents of the medical, adding that he was also subjected to a hemorrhoids test (“bend over & let me see if your hat’s on straight”…) and a test for “rupture” (“Just cough for me, will you?”). He also encountered the ‘torture machine’, actually a test for diseases of the lungs. At the end of an exhausting day of being grilled, poked and prodded, Phil was told he would be accepted for the Air Force Reserve but that he would be required to have his tonsils removed and six teeth filled at his own expense first. After some indecision he had the required work done and was duly enlisted in the Royal Australian Air Force Reserve, to await call-up. He was given a badge to wear to say that he had enlisted and continued to work at the Yarraville Sugar Refinery for another six months. Though Phil doesn’t mention it, it appears that recruits would be given a course of study in mathematics, physics and navigation to do while they were awaiting call-up, to improve their chances of coping with the early, theoretical stages of their training. This is what Don Charlwood called the ‘twenty-one lessons’. In his memoir ‘Journeys into Night’ he describes the course as ‘extraordinarily well-arranged’. Recruits living in towns could attend night schools to complete the course; others living further out (like Charlwood himself) needed to work by correspondence, helping mates out as they went. Morse code was taught by local postmasters (C07-034-xiii). Reservists were on the Reserve for differing periods of time. Don Charlwood’s mates Jim Riddoch and Claude Austin were called up after seven months; Charlwood himself had to wait eleven (C07-034-xiv). In fact Riddoch would be in Canada beginning his training before Charlwood received his call-up papers. Phil Smith was waiting for ‘only’ about six months. But the letter arrived, and on 14 September 1940 Phil found himself on a train from Melbourne to his Initial Training School at Bradfield Park, Sydney. Life would never again be the same.